Researchers at the University of Central Florida have developed a new color changing surface tunable through electrical voltage - a breakthrough that could lead to three times the resolution for televisions, smartphones and other devices. Video screens are made up of hundreds of thousands of pixels that display different colors to form the images. With current technology, each of these pixels contain three subpixels—one red, one green, one blue. But a scientific advancement in a lab at UCF's NanoScience Technology Center may eventually make that model a thing of the past. 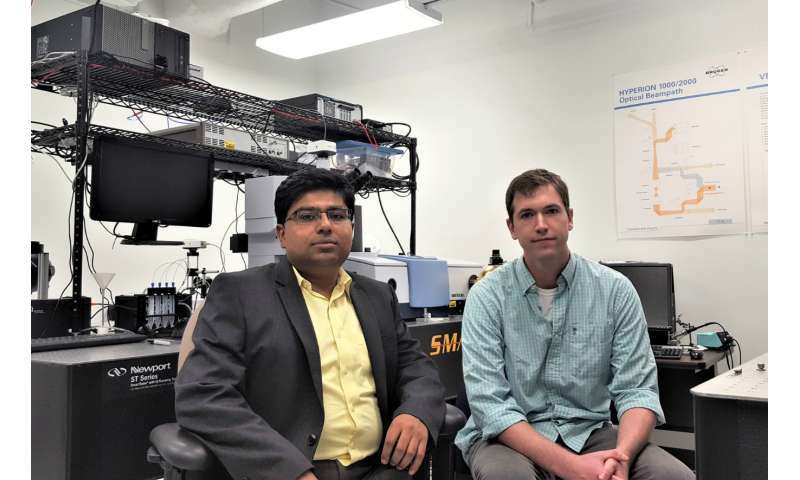 Assistant Professor Debashis Chanda and physics doctoral student Daniel Franklin have come up with a way to tune the color of these subpixels. By applying differing voltages, they are able to change the color of individual subpixels to red, green or blue - the RGB scale—or gradations in between. "We can make a red subpixel go to blue, for instance," Chanda said. "In other displays that is not possible because they need three static color filters to show the full RGB color. We don't need that now; a single subpixel-less pixel can be tuned across a given color gamut." The research was reported this month in the academic journal Nature Communications. Aside from the inherent value of an improved design for the pixel-based displays that are ubiquitous in today's world, their findings have other advantages. By eliminating the three static subpixels that currently make up every pixel, the size of individual pixels can be reduced by three. Three times as many pixels means three times the resolution. That would have major implications for not only TVs and other general displays, but augmented reality and virtual reality headsets that need very high resolution because they're so close to the eye. "A subpixel-less display can increase resolution drastically," Franklin said. "You can have a much smaller area that can do all three." And because there would no longer be a need to turn off some subpixels to display a solid color—there would be no more subpixels, after all—the brightness of screens could be much greater. Franklin and Chanda built on earlier research that demonstrated the world's first proof-of-concept display utilizing the plasmonic phenomenon (Nature Communications, Vol. 6, pp. 7337, 2015). They've created an embossed nanostructure surface resembling an egg crate, covered with a skin of reflective aluminum. However, they needed several variations of this nanostructure to achieve the full range of colors. In their latest advance, they found that modifying the roughness of the surface allowed a full range of colors to be achieved with a single nanostructure. The nanostructure surface can be easily integrated with existing display technology, so the underlying hardware wouldn't need to be replaced or re-engineered. "It allows you to leverage all the pre-existing decades of LCD technology. We don't have to change all of the engineering that went into making that," Franklin said. The researchers are now taking steps to scale up their displays in preparation for bringing the technology to the private sector. On some of the forums I go to people already are saying they have no interest in seeing people's pores in detail, how much makeup they have on, etc. How much resolution do we need? Also, as one guy put it, I don't have 4K eyes so what good is it? Well if a small display had a higher resolution it could be optically magnified to show greater detail. Perhaps it would use less power for a given resolution display or be easier to package. It should be like looking out a window. Its no ways near that yet. It not detail so much as accuracy. I agree with mitchbaskett. The only advantage I see is something like displays on the side of blimps. They would be viewable from miles away. But my TV is already amazingly clear.